US forces will not leave Syria until Turkey guarantees the safety of US-backed Kurdish militias, National Security Advisor John Bolton has said, as cited by AP. He added that there was no timetable for a US withdrawal. Bolton also stressed there was no set timetable for US withdrawal from Syria, adding that Washington was not interested in maintaining a long-term military presence in the country. “The timetable flows from the policy decisions that we need to implement,” he noted. Bolton’s statements provoked a critical response from Ankara. It is “irrational” to claim that Turkey targets Kurds in its operations, the Turkish president’s spokesman Ibrahim Kalin said, adding that the Turkish military campaign is aimed against Islamic State (IS, formerly ISIS/ISIL) as well as against the Kurdish YPG and PKK groups, which Ankara sees as terrorists. Bolton made his comments while on a visit to Jerusalem, where he is meeting with Israeli officials to explain Donald Trump’s sudden announcement last month that American forces stationed in Syria would be coming home. Although Trump vowed to bring US troops home as soon as possible, bitter disagreements between Washington and Ankara over the status of the Kurdish militias will likely bring the withdrawal to a halt. Turkey has labeled the Kurdish YPG – which receives support from the Pentagon – as a terrorist group. Bolton will travel to Turkey on Monday, where he is expected to lay out Washington’s demands to Turkish President Recep Tayyip Erdogan. 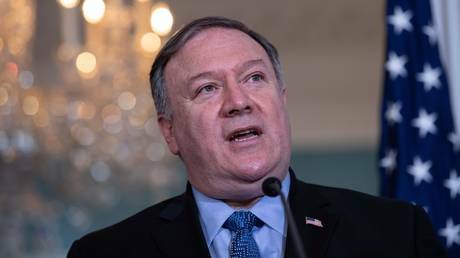 On Thursday, Secretary of State Mike Pompeo said that “the importance of ensuring that the Turks don’t slaughter the Kurds” was “still part of the American mission” in Syria. His comment was condemned by Ankara, which creatively argued that Pompeo was comparing all Kurds to terrorists.